If there is one sub-genre in film that I’ve always found fascinating, it would be the entire world of disaster films. However, no matter how many of these things pop up, critics everywhere continually put them down and call them horrible, no good excuses for movies. I’m not sure what critics thought about San Andreas, but once again, I’m blown away by the magnificent damages…but funny enough…I still prefer Emmerich’s work over this – even though the story in this film has a much stronger foundation. Meet Ray, a search and rescue helicopter pilot that’s good at what he does – he goes around California and rescues people in need when he gets the call – but when major disaster strikes, Ray immediately gets selfish, ignores millions of people in need and heads after his own flesh and blood. Sorry, California, The Rock says family comes first. That’s right, the West Coast is hit by the strongest earthquakes this country has ever seen…quakes that the entire country will feel. You know what I love about this movie? It doesn’t go the sci-fi route and overdo itself. You half expect these earthquake magnitudes to be astronomical – like something that measures 30.5, but instead you get something higher than normal, but still relatively believable, and not far off from the worst quakes of our past. That’s the thing about the movie – the entire reason you’re watching it is for the endless debate about when California will finally break away from the rest of the country and basically sink into the Ocean. Well, San Andreas definitely takes its own liberties in asking what if the fault line is bigger than we thought, but past that – it definitely leaves you in awe at the sheer possibility of getting hit by a natural disaster that could leave us shattered in the near future. You have a lot of great A-list actors in this movie that don’t exactly have the best chemistry or anything – but because everyone in the world is united and afraid of the same thing…you sort of like them anyways. You can’t help but hope they get out alive, because this is a man vs. nature scenario…how the heck do you get out of this one, Dwayne Johnson? It’s literally a doomsday prediction, like 2012, but this isn’t exactly a prophesy…it’s something that can be explained by science. Which makes it a bit creepy if you ask me. I know you’re wondering about CGI, and on a scale between this and Emmerich, I’d say it’s right on par. However, in the beginning, there are some weird flaws with some basic CGI physics, but it doesn’t last for long, so it’s not a big deal. My main complaint about the movie basically deals with actors. The characters are all great, but the casting was clearly done to draw in an audience. All of these famous faces are great, but they don’t make a lot of sense together – so they don’t have natural chemistry. 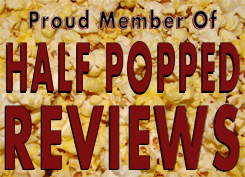 Thankfully, it’s not exactly a romance movie and it doesn’t hold too strong of expectations other than insane action and visual effects – but this was a very easy fix that could have been avoided. I’m just saying. 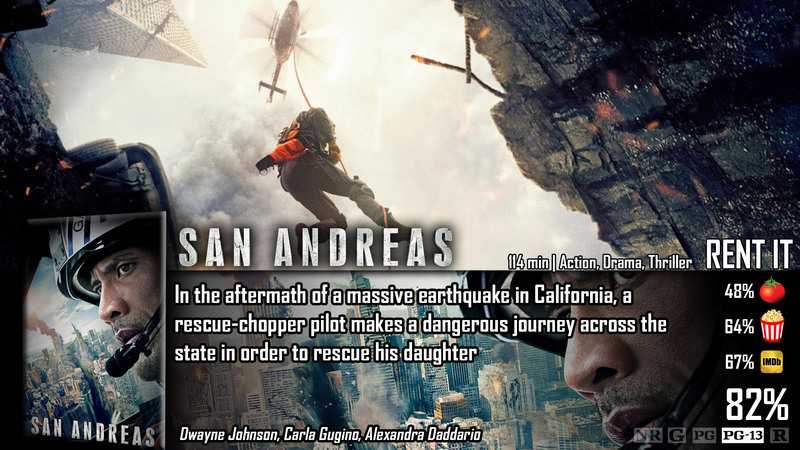 San Andreas is a very good action/adventure disaster film that visits a subject that I’m surprised hasn’t been touched yet (other than San Andreas’ rip-off film, San Andreas Quake) – given that they’ve been talking about this for years, it needed to happen, and I’m glad it did. The actors and their chemistry didn’t make a lot of sense – they put more focus on the actors being a-listers than making sure they fit both the characters and together.